Connecticut’s largest fishing & hunting show. Bring the whole family for a fun filled day of entertainment! 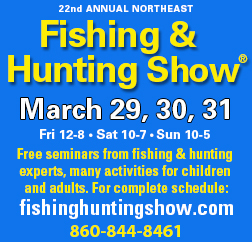 A 5,000-gallon fish tank with live fishing demonstrations, free seminars by fishing and hunting experts on many topics, the latest gear for purchase, no-cost appraisals of antique/collectible fishing lures and tackle, and hands-on activities for all ages will be found at the 2019 Northeast Fishing & Hunting Show. Salute to Service! Join the US Department of Veterans Affairs on Saturday, March 30, for Military Appreciation Day at the Northeast Fishing & Hunting Show. The first 200 Veterans with proper proof will gain free access to the show! Valid ID is required. Friday: 12:00 p.m. – 8:00 p.m.